..:: Welcome to Eggs4u.net ::..
For years, the management of Seven Eleven stores have required high manufacturing standards for the produce offered in their stores. Fresh eggs from BUSAKON FARM have been on the shelves of Seven Eleven stores from the early days when their first stores opened in Chiangmai, Lumpoon, Mae Hong Son. "Sod Jak Mae Kai, Plod Pai Took Fong" which translates to "Fresh & Hygienic Eggs." 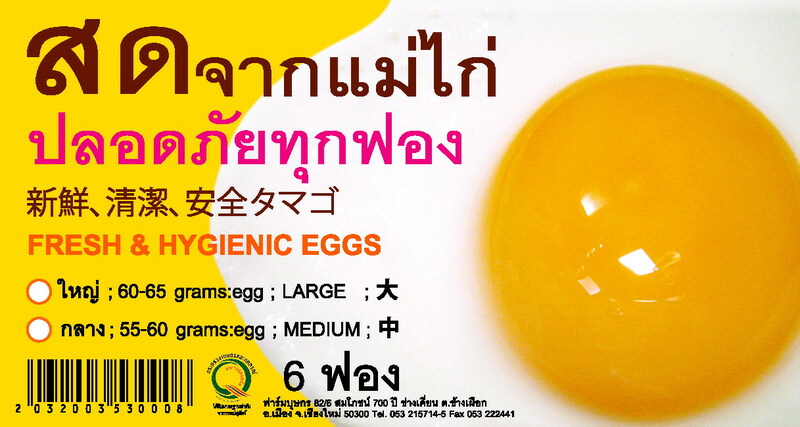 As Seven Eleven stores have grown to be the staple of modern life in Thailand that they are today, they continue to recognize and value the high standard of our eggs. - Site visit to inspect the production line in January and November, 2008. - Establishing an agreement between the buyer and supplier on food safety policy in February, 2009. We at BUSAKON FARM are proud to satisfy the production criteria set forth by the management of Seven Eleven stores. We work hard to maintain good agricultural practices, so that when our fresh eggs arrive at your dining table, they''re the most nutritious, hygienic, and delicious eggs around. Copyright © EGGs4U.NET All right reserved.